Posterior tibiofibular ligament includes a deep along with superficial part. The superficial part extends obliquely via the lateral malleolus to a broad connection on the posterolateral tibia tubercle. This deep part is more transverse and functions as a labrum, intensifying the tibial articular side. This part is thick as well as strong and also emerges via the round posterior fibular tubercle, entering on the lower part of the posterior border of the tibial articular side. The superficial part emerges at the posterior tubercle and runs distally and laterally towards the fibula, where it enters in the posterior side of the lateral malleolus. This part would be correspondent to the anterior tibiofibular ligament. The phrase posterior or posteroinferior tibiofibular ligament is typically utilized to describe the superficial part. The deep part is the transverse ligament. This ligament is thick, strong, and also conoid with a twist to its fibers; it emerges via the round posterior fibular tubercle situated over the digital fossa as well as via the upper section of the digital fossa. This ligament enters on the lower part of the posterior border of the tibial articular side and reaches the medial border of the medial malleolus. The fibers are directed up, medially, and posteriorly. At the posterior border of the tibial articular side, the fibers alter directions and end up being horizontal or transverse. The insertion is greatest on the outer half. In the posterior half of the medial side of the lateral malleolus lacks articular side however is filled by the transverse ligament, which communicates with the talar side and leaves its imprint as a diagonal triangular facet on the posterior half of the lateral border of the superior talar side. The transverse ligament comes down below the posterior tibial margin and also makes up a true posterior labrum deepening the tibial articular side. The tibiofibular syndesmosis is a framework that keeps the relationship in between the distal tibia along with fibula. The syndesmosis includes four parts: anterior inferior tibiofibular ligament (AITFL), posterior-inferior tibiofibular ligament (PITFL), transverse ligament and also interosseous membrane. 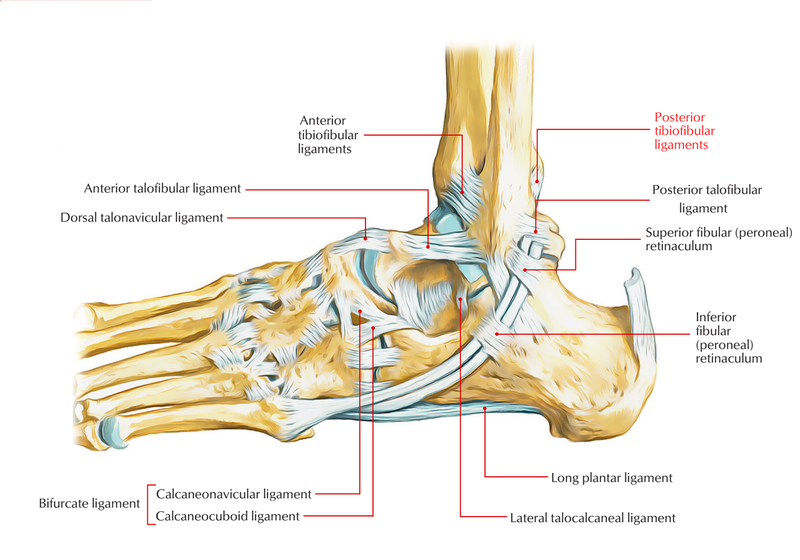 The anterior as well as posterior tibiofibular ligaments are connected superiorly and also medially to the tibia and also inferiorly along with laterally to the fibula. The most distal element of the lower tibiofibular ligament and also posterior tibiofibular ligament is referred to as transverse ligament.